It seems like there’s no end to TV shows about criminals who have various psychiatric disorders. It’s understandable that we find them fascinating, but how accurate are they? What is it really like to work with individuals who are convicted of serious crimes but who are unquestionably suffering from a mental illness? If you’re interested in these questions or are thinking of going into the field of forensic psychology then you need to listen to Dr. Susan Lewis as she tells us about two of the many clients she came to know during her years in this field. You’ll hear about the case of “Jay” – a deeply troubled man who is stuck in a revolving door between in-patient psychiatric hospitals and the criminal justice system. You’ll also hear about “Kristen” – a deeply violent woman who can’t get the help she needs. 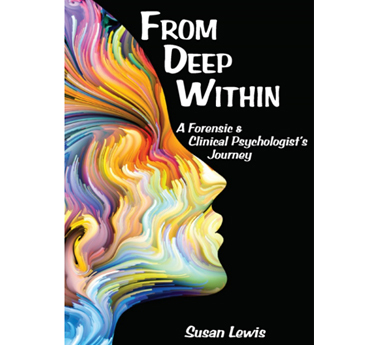 Dr. Lewis is the author of a book called “From Deep Within: A Forensic and Clinical Psychologist’s Journey” and in this honest and moving interview you’ll learn what it’s really like to work closely with individuals like “jay” and “Kristen”. Interesting interview Michael, this is my interpretation. I think the brute strength of the internal drivers that those with violent and antisocial behaviour experience is impossible for the sane to understand. The psychic pain the patient feels cannot be brought into consciousness so it has to be projected out. Once it is externalised it then becomes a threat and must be dealt with and one way is to use extreme violence against it. Failure to externalise the pain will see it manifest as an internal force which may then become personalised as voices. The emotions that cannot be metabolised may then also become translated into images and visions which could be where the flattening of affect and delusions of psychosis come from. The outcome of this is often suicide which is a process of attempting to kill the pain with the unfortunate outcome that the body is also destroyed. So the paradox the patients finds themselves in, is that in order to be authentic to themselves they must have the initial source of their pain confirmed and then feel that revenge can be justified. What of course they fail to understand is that the initial pain was often experienced when they were in a helpless infantile state and as such were helpless. Now they are a strong adult able to inflict hurt but the drivers are those of the infant who was helpless so there is a sort of cognitive dissonance which the patient is unaware of.